Recession: Economics. a period of an economic contraction, sometimes limited in scope or duration. Depression: Economics. a period during which business, employment, and stock-market values decline severely or remain at a very low level of activity. 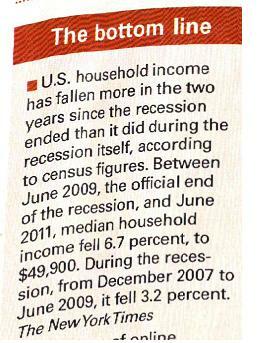 Now tell me again without laughing that we are out of the recession and depression. Posted in Current events, Non Fiction.Tagged 2 cents, economy.